Should Raised Shoulders Be Considered Sidewalks? Are raised shoulders considered sidewalks? A simple question with, apparently, a simple answer. No. Naturally, this answer begs a follow-up question. Should raised shoulders be considered sidewalks? What is a raised shoulder? An example of a raised shoulder along Olive Blvd in Olivette. Are raised shoulders considered sidewalks? I asked Todd Waeltermann of the City of St. Louis Street Department if the raised shoulder on Forest Park Pkwy at Des Peres Ave is considered a sidewalk. He said “no.” MoDOT, is seems, would agree as their Engineering Policy Guide §642.1.2 Sidewalk Design Criteria states that raised shoulders are not to be considered sidewalks. Sidewalks are not to be designated on paved shoulders located behind a mountable curb. Should a raised shoulder be considered a sidewalk? On urban roadways, the shoulder is located inside a curb. Surfaced areas behind curbs located on urban roadways may be perceived as a sidewalk and thus subject to ADA requirements. Therefore, a surfaced area is not to be provided behind a mountable curb. Yes, raised shoulders should be considered sidewalks and the reason is perception. To a pedestrian, there is little to no distinction between a raised shoulder and a sidewalk. MoDOT’s Engineering Policy Guide says as much. The only notable difference between a sidewalk and a raised shoulder is the presence of a mountable curb. The surface material of a raised shoulder is no different than that of many sidewalks and sidewalks are frequently built adjacent to the roadway. Lastly, a curious bit is MoDOT’s reasoning for not wanting to construct raised shoulders: it’s not for safety reasons, but to avoid ADA requirements. Within the urban and suburban areas of Greater St. Louis, raised shoulders should be considered sidewalks and be outfitted with ADA accessible curb ramps. If people perceive a path as a sidewalk, it should be recognized as a sidewalk. Acknowledging the issue of perception, MoDOT has been slowly adding curb ramps to many roads with raised shoulders or converting them into true sidewalks (albeit poorly). 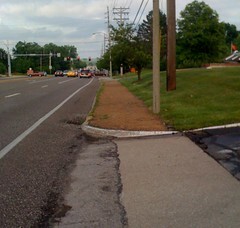 Various stretches of both Lindbergh Blvd and Olive Blvd have been outfitted with curb ramps or real sidewalks. Hopefully, the city will also recognize the issue of perception.